We co-founded LifeM8Z (pronounced Life Mates) to help couples learn how to give and receive love; improve communication and intimacy; and heal fractured relationships through apology, forgiveness, and letting go. We have been courting for 38 years and have survived and thrived more than 36 years of marriage. Coaches and mentors of hundreds upon hundreds of couples at regional and national Better Marriages Conferences, group retreats and in personalized one-on-one sessions. The Make Every Day Valentine’s Day Workshop is focused on meeting the needs of married couples, engaged couples, couples thinking about marriage, committed couples and partnerships, and couples preparing for their next marriage. Over our 36 years of marriage and our 27-year military career, we’ve watched far too many of our friend’s marriages end in divorce. We noticed that many of them encountered the same relationship storms and derailments as we did…but we made it. In addition, during this workshop you’ll discover how to transform your marriage, equip yourself with the tools to overcome any challenges that may arise, and have a relationship that resonates with the love and passion of Valentine’s Day every day of the year. Why Is The “Make Every Day Valentine’s Day” Workshop Experience Different? 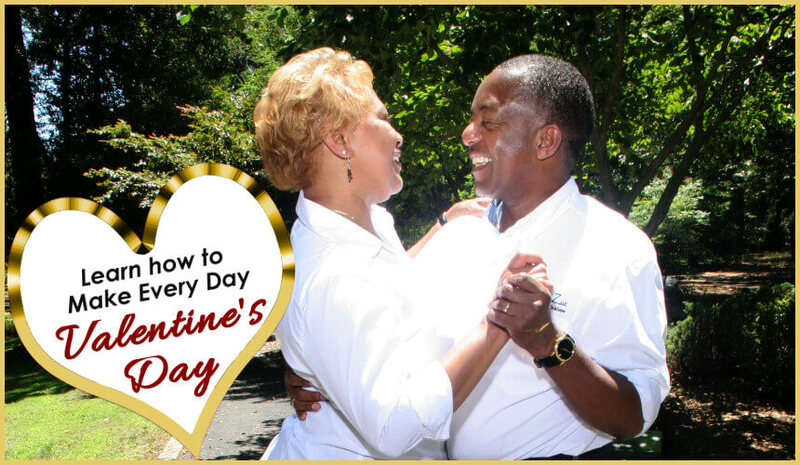 Won’t you join us and start creating a relationship where every day is Valentine’s Day? Register Today!